Today’s story teller is a novelist, KikukoTsumura. Being early 30s, she said her food preference changed since she was in 20s. The most attractive foods for her are bread and potato. She can spend 30 minutes just thinking about potato, and the purpose of going to American restaurants is to eat mashed potato, but not for meat. Eating too much carb causes health problems, so she can’t just eating mashed potato, but since mashed potato is not sold at Japanese supermarkets, it’s not so hard to run away from the temptation of mashed potato. According to Tsumura, the problem is the temptation of bread. In Japan, bakeries are everywhere and bread is high-calorie food. 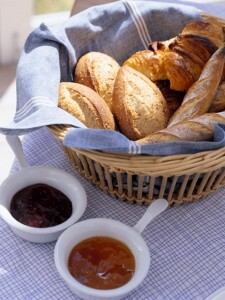 Not only bread but the toppings like butter and jam have a lot of calories too. “I often say, ‘I am happy with just some butter on my bread!’ but butter has much more fat than ‘just’ ” therefore; her friend and she swore that they eat bread only at special occasions. Thank you for your comment. Cutting bread to you is like cutting rice to me. Aw, it seems really hard! But like we have brown rice, you must have healthier bread too. By the way, reading the menu you wrote made my mouth watering (^o^) Roasted Chicken and bread and mushroom soup sound so good! Well, if you love cooking, you can always devise healthy meal. I think that’s good. Thanks!